Fennel is another great fall ingredient in my opinion. If you have never tried fennel, a.k.a. "anise"... don't be scared! It smells and tastes like licorice when raw (Note: I do NOT like licorice), but roasted fennel is sweet and buttery and not at all licorice-ey (sp?). 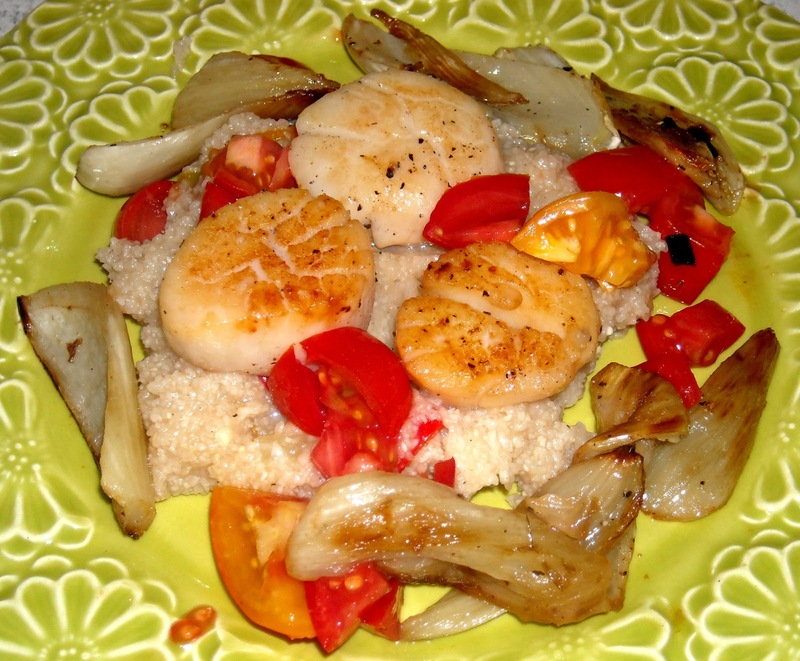 I also love scallops. So this dish was a big hit in our house! Lightly oil the bottom of a baking dish or cookie sheet. Arrange the fennel in the dish. Sprinkle with salt and pepper. Drizzle more olive oil on top of the fennel pieces and mix with your hands so all of the fennel is coated with oil. Bake until the fennel is fork-tender and the top is golden brown, about 45 minutes. Chopped fennel ready to be roasted! Dice the jalapeno and bell pepper. Bring the vegetable stock to a boil in a large sauce pan over high heat, covered. Add the peppers to the stock. Uncover and slowly whisk in the grits, 1 teaspoon salt, and 1/2 teaspoon pepper. Reduce the heat to medium-low and cook, stirring occasionally, until thickened, about 5 minutes. Stir in the cheddar cheese (optional) and 1 tablespoon butter. Remove from the heat and season with salt and pepper. Cover to keep warm. Preheat a large saute pan and drizzle with olive oil. Season the dried scallops with salt and pepper on both sides. Add the scallops to the pan. If the oil doesn't sizzle when you put the scallops in, it isn't hot enough and you won't get a good sear. Cook the scallops for about 5 minutes, until golden brown on the bottom, and then flip over to the other side. Cook for another 3-4 minutes. When the scallops are done, they should be slightly firm when you touch the top, but not too firm or they will get chewy. Remove them from the pan and place on a paper towel. Serve the scallops and fennel on top of a large spoonful of grits. I garnished with some chopped fresh yellow and red tomatoes from the garden. Yum!